Dr Macgroarty was very pleased to be the only Australian surgeon invited to participate on faculty at the Rocky Mountain International Shoulder Symposium, Calgary, Canada 8-9 February 2019. A SLAP tear is an injury to a part of the shoulder joint called the labrum. The shoulder joint is a ball and socket joint, similar to the hip; however, the socket of the shoulder joint is extremely shallow, and therefore unstable. 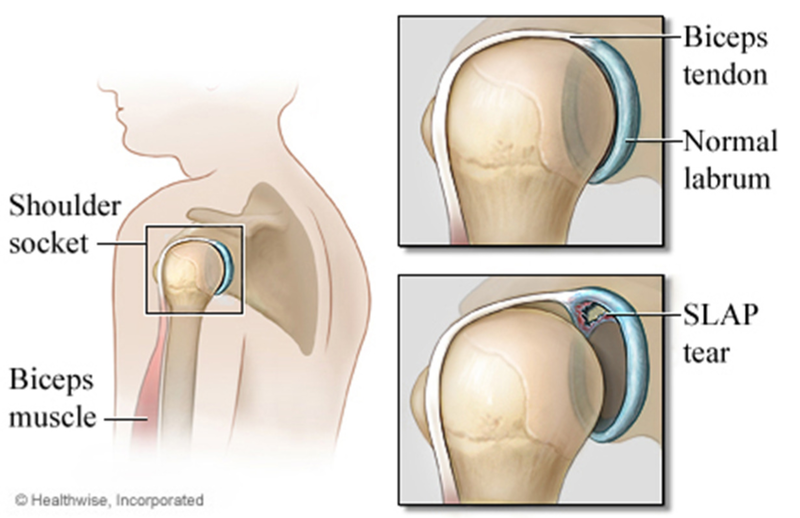 To compensate for the shallow socket, the shoulder joint has a cuff of cartilage called a labrum that forms a cup for the end of the arm bone (humerus) to move within. A specific type of labral tear is called a SLAP tear; this stands for Superior Labrum from Anterior to Posterior. The SLAP tear occurs at the point where the tendon of the biceps muscle inserts on the labrum. This injury was first identified in the 1980s in athletes, like baseball players, whose sport requires them to do a lot of overhead throwing. Many people with SLAP tears also have other shoulder injuries, such as a tear in the rotator cuff. What symptoms would I have? Painful popping, clicking, or catching in the shoulder. Pain when you move your arm over your head or reach back. Pain when you throw a ball. An ache often described as being deep inside the shoulder. associated biceps tendonitis, patients may complain of pain over the front of the shoulder. How is a SLAP tear diagnosed? A thorough medical examination together with careful questioning can help your surgeon identify symptoms consistent with a SLAP tear. A SLAP tear can be hard to identify, because there are so many other things that can cause shoulder pain and also because SLAP tears are not common. SLAP tears tend to be identified best on MRI when the study is performed with an arthrogram. This is a type of MRI scan which includes injecting the shoulder with a contrast fluid which highlights any tears, including the SLAP tear. Sometimes the diagnosis of a SLAP tear is made at the time of surgery. What are the treatment options for a SLAP tear? Physiotherapy – This may be recommended to help with stretching and progressive strengthening exercises. These can assist with muscle endurance and restore the normal range of motion. Overhead activities will be resumed gradually. Anti-inflammatory Medications – These medications can be helpful in reducing swelling or inflammation in the shoulder joint, and in turn reducing pain. Ice – Ice applications can help control the inflammation and reduce the swelling. By reducing the inflammation and swelling the tendons can return to their usual state and perform as usual. Injections – Cortisone injections can be used to reduce inflammation in the shoulder joint. This in turn usually helps decrease pain and allows for further physiotherapy. The effects of cortisone are temporary, but can provide months of relief. 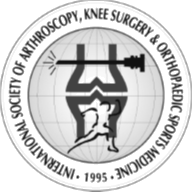 In patients who have continued symptoms despite these treatments, arthroscopic surgery of the shoulder may be recommended. There are several specific surgical procedures that may be performed, and it is important to understand that SLAP tears often occur in conjunction with other shoulder problems such as rotator cuff tears and even shoulder arthritis. In these cases, surgical treatment will take into account these factors. option is only suitable for minor tears that do not involve the biceps tendon. labrum down to the shoulder socket. A SLAP repair is best suited to patients with an otherwise healthy shoulder who want to remain athletically active. Biceps Tenodesis – A biceps tenodesis is a procedure that cuts the biceps tendon from where it attaches to the labrum, and reinserts it in another area. The idea behind a biceps tenodesis is that by decreasing the forces that pull on the SLAP region, the symptoms will be alleviated. A biceps tenodesis is most often performed on patients over 40 years of age or patients with associated biceps tendonitis or tearing. A biceps tenodesis can either be performed arthroscopically, or through a small incision over the top of the shoulder. Determining how to best perform a biceps tenodesis depends primarily on other conditions being treated within the shoulder joint. What is the rehabilitation after a SLAP repair? Rehabilitation varies depending on factors such as the strength of the SLAP repair, and the preference of the surgeon. During the first phase of rehabilitation, the torn labrum must be allowed to heal in its proper position therefore only some passive motion is allowed for six weeks to prevent shoulder stiffness. A sling is also worn after the surgery. Once the repair has healed, patients then enter the second phase of rehabilitation and can begin more movement at about six weeks. Physiotherapy continues to help maintain motion and regain strength of the shoulder. The final phase of rehabilitation involves more active strengthening of the muscles that surround the shoulder joint, and full recovery is expected between 3 to 4 months. The patient information sheets are intended to provide general information only and are not a substitute for medical advice about your particular condition. E-mail: office@kneeandshoulderclinic.com.au Dr Kelly Macgroarty is a foundation member of the Brisbane Knee and Sports Surgery group.